This hike begins at the Herman Creek Trail head. Often you have to park on the frontage road if you try to hike from this trail head before the Herman Creek campground is open. Recently, the gates to the campground/trailhead have been open all year. As you hike along this main trail, you will come to a junction that leads to the PCT and Benson Ridge, but bear left and follow the signs to Gorton Creek trail. At about 1.2 miles you will begin a more serious climb to elevation at an overlook of Indian Point. There is a unmaintained trail out onto the point, but use EXTREME CAUTION if you are tempted to hike out there. Complete you hike by taking the cutoff Trail #437 to Trail #447, which is your elevator back to the bottom where you began. Just keep straight ahead on what is signed as the Gordon Creek Trail, and you will find your way up to the Indian Point overlook. This overlook is a not so obvious users trail at the corner of a sharp switchback that turns you away from what is obviously the edge of a high cliff. Use caution as you walk toward the edge for a better view. Then return to the main trail and continue uphill through a couple of switchbacks to a junction of the trail that is a cutoff trail to the southwest. Continue straight ahead for a few feet past this junction and you will see a very distinct users trail dropping steeply off the left side of the trail. This users trail will take you out on Indian Point. Use extreme caution if you go out there as it is life endangering. 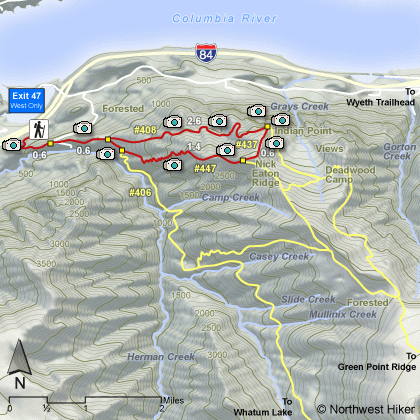 Herman Creek Trailhead: From the west, travel on I-84 to Exit #44/Cascade Locks. At the stop sign turn right/east and follow Wa-Na-Pa street through town. Continue under the freeway and turn left/east on Frontage Road (on the south side of the freeway) to the Herman Creek Campground sign. 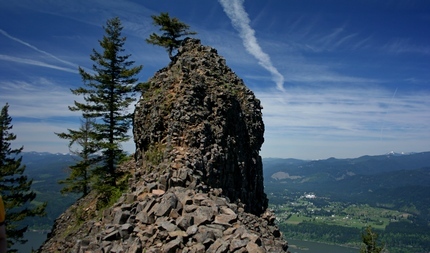 From the east, take Exit #44/Cascade Locks. Immediately turn left and travel under the freeway. Turn left/east onto Frontage Road (on the south side of the freeway) to the Herman Creek Campground sign. Follow the narrow, paved road that goes up to the campground (to the left) and trailhead (to the right). There is room to park at the trailhead, and along the road towards the campground, but don't block the campsites in the campground. Sometimes in the winter the gate is closed but you can park along Frontage Road. Hike up the 1/2 mile paved road to the trailhead.